Beecentric hive is a Warre hive, 8 frame Langstroth hive hybrid handmade and sold in Edmonton, Alberta, Canada. The apicentric hive is designed to work with the natural behaviours of the honeybee. The result is happier, heather bees, and less work for the beekeeper. The beecentric hive can be managed like a traditional Langstroth hive (by adding to the top; super) or in the style of a Warre hive (adding from the bottom: nadir). The hive uses 8 frames instead of 10, as the over-wintering cluster of bees is the same width as the hive. Using medium boxes for everything (brood and honey) simplifies your beekeeping operation and increases your options. - Two entrance reducers of different sizes. 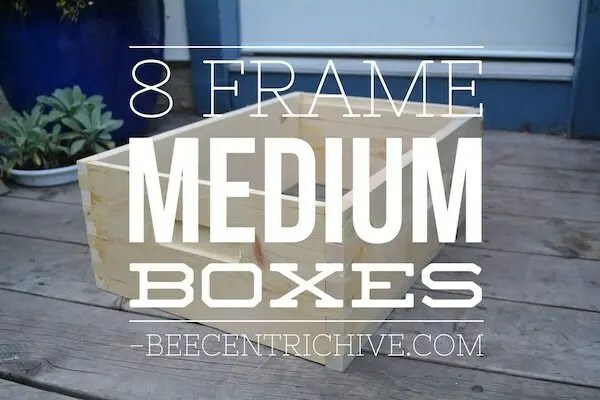 Eight-frame medium hive boxes for honey supers and brood boxes. Unlike conventional Langstroth hives, the Beecentric Hive uses eight-frame medium boxes for both brood and honey. No need to worry about purchasing separate boxes or two sizes of frames. The only difference between a brood box and honey super is what’s in them. This is especially helpful for splitting colonies or making nucs. With a common size box, splitting a hive is easy – simply transfer brood, pollen, and some frames of honey from an established hive into an empty hive box. No need to worry about mismatched frame and box sizes. Everything is consistent. Eight frame medium boxes are ideal for over-wintering because they are the same width as the brood nest and overwintering cluster of bees. With less space to heat, the bees don’t have to work as hard. In larger 10-frame hives, it’s not uncommon for overwintering bees to starve when the temperature drops down, and they’re unable to reach honey contained within the outer two frames. The 8-frame hive eliminates this problem by matching the hive to the natural dimensions of the bee cluster making is a must have feature for cooler climate beekeepers. When filled with honey, eight-frame medium boxes weigh between 40 and 50lbs. In contrast, ten-frame deep boxes filled with honey can weigh between 75 and 90lbs. Beecentric hive, Warre style vented roof. The Beecentic Hive is topped off with a beautiful Warre Roof built to shed the elements. This sloped roof design protects the hive from rain, wind, and snow while ensuring adequate insulation and ventilation. Designed to fit over the top quilt, you don’t need to worry about the wind blowing this one off! Oh, did we mention that it also looks great! This Warre top-quilt has a 1/8 inch hardware cloth bottom. Placed on top of the beecentric hive and loosely filled with bedding such as straw or wood chips. The top quilt provided a balance of ventilation and insulation for the bees. Keeps bees warm and dry. A Warre top quilt is a shallow box that sits on top of the hive and is filled with a bedding material such as straw, sawdust, or wood chips. The quilt box has a 1/8th-inch wire mesh bottom that separates the hive from the bedding material and prevents moisture from building up. Over time, the bees add or remove propolis from the mesh to regulate the airflow. The top quilt is ideal for over-wintering bees, as it provides insulation from the elements while allowing moisture to escape the hive. The beecentric hives mobile entrance allows you to place the entrance wherever you want. Nothing about natural honeybee behavior says that the entrance has to be on the bottom. So to give you (and the bees) more options, the Beecentric hive uses an innovative floating entrance design. A separate component from the rest of the hive, a floating entrance can be placed between any two hive components giving you the versatility to install entrances wherever you want. Integrated Pest Management (IPM) Bottom Board with 1/8″ galvanized hardware mesh. Comes with chloroplast insert for mite checks and closing the hive up for the Winter.